Hey y’all, happy Monday! 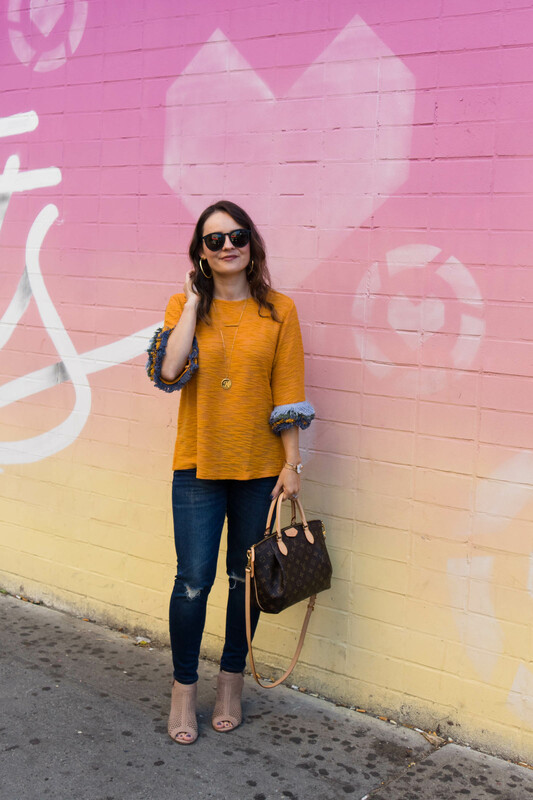 Today I’m sharing my last post from our trip to New York and talking about the cutest fringe sleeve sweater that needs to make it’s way into your closet for fall. Seriously, just look at those sleeves! I got this fringe sleeve sweater a few weeks ago but hadn’t been able to wear it until my New York trip because it’s still in the 80’s down here! So I thought it was only fitting to wear the first day of October. The fun sleeves completely sold me and you can’t beat the price (under $20!). It has a slightly boxy/flowy fit and runs TTS, I’m wearing an XS. It also comes in navy and white if you’re not into mustard. 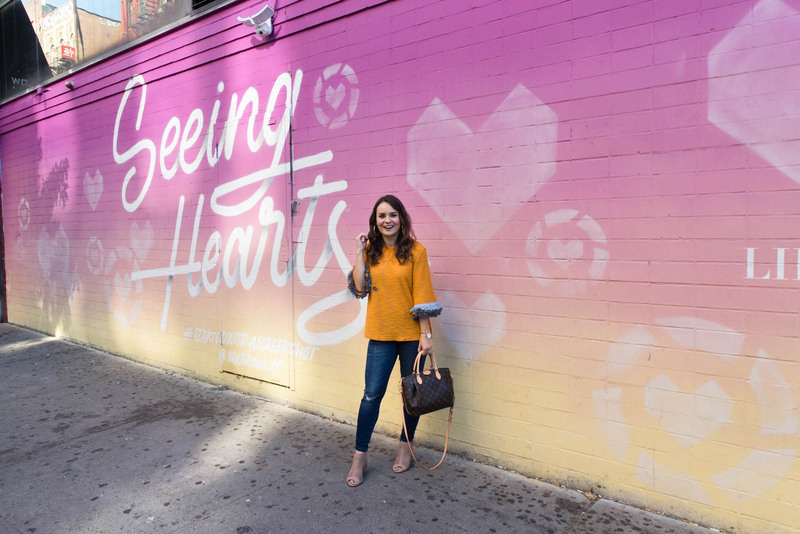 And it just so happened that the Like to Know It heart wall was 2 blocks away from our brunch at Hotel Chantelle so of course we had to snap some photos! And don’t mind all the cigarette butts… that’s just New York for ya! I’m sure most of y’all are aware but for those that aren’t, Like to Know It is an online platform that allows bloggers and influencers to create shoppable links for their followers on Instagram. 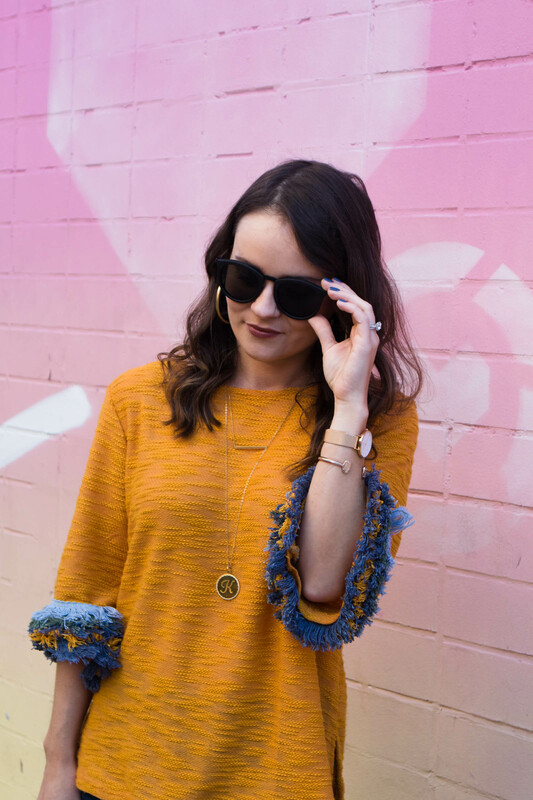 That way when we share a fun new outfit or sale item, you can “like” the photo and get an email within 5 minutes with ready-to-shop links for all the pieces. You can sign up here, it’s super quick and easy. There is also an app where you can look up your favorite bloggers and shop their feeds directly- thank goodness for technology, right?! I worked Saturday but also had some time off this weekend since Ryan’s dad was in town. We also finally finished the first season of This Is Us last night and hopefully will get all caught up this week. Also, can we talk about how happy I am that Grey’s is back on? This is the first time that I’ve been caught up with the current season and it feels so good- hands down the best show on TV! Thanks for reading and be on the lookout for another home tour post coming to the blog this week! That sweater is so fun!!!! I love the sleeve details and it looks like good quality for the price point. the sleeves on that sweater are to die for!! Such a cute top! 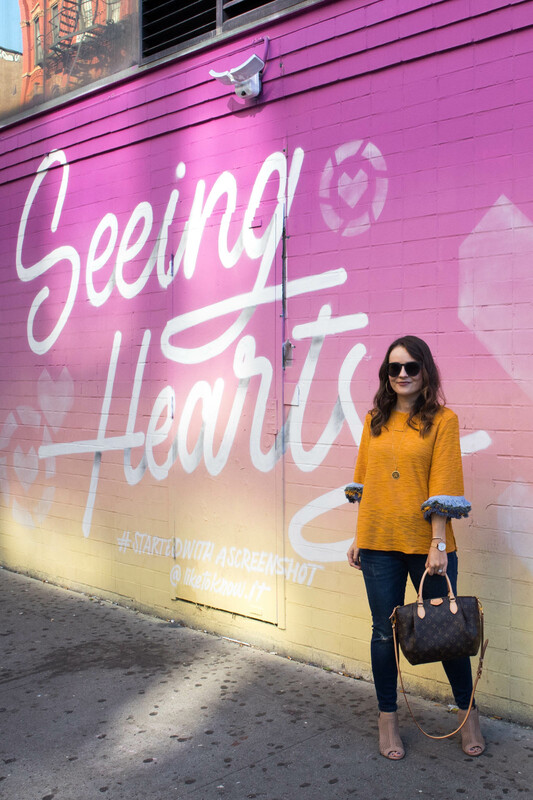 I wish I would I have taken the train into NYC to take a picture with this wall! Looking cute girl! I love the sweater, the color, and the fringe really pulls everything together! 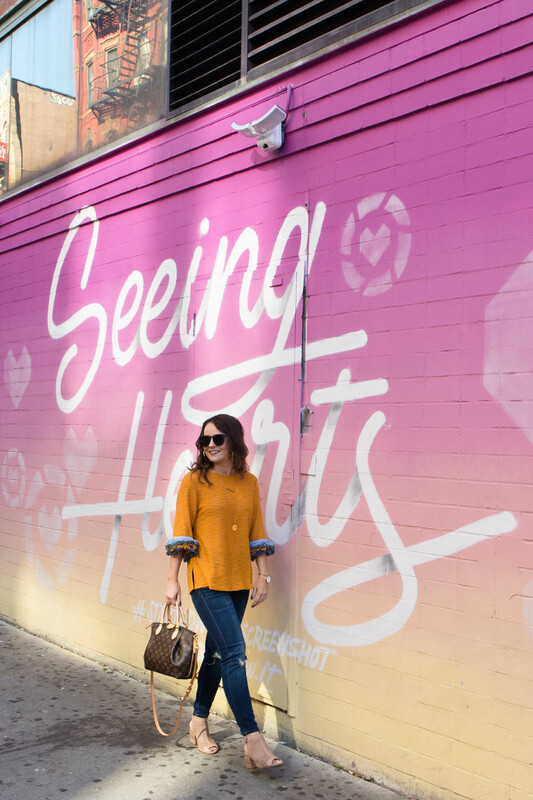 I love the jeans and the booties you paired with it! You look so adorable! That fringe sweater is too fun. I love it! 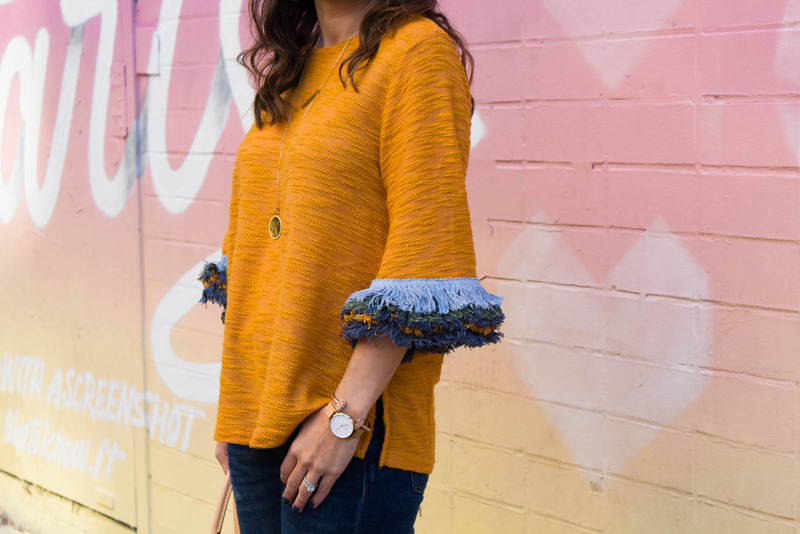 That fringe sweater is so fun! Love the mustard color! So perfect for fall. I adore this shirt. The detailing and the color is so unique. That top is absolutely amazing!!! Obsessing over the fringe detail!! AHHH I haven’t seen a top like this before. Loving the fringe. 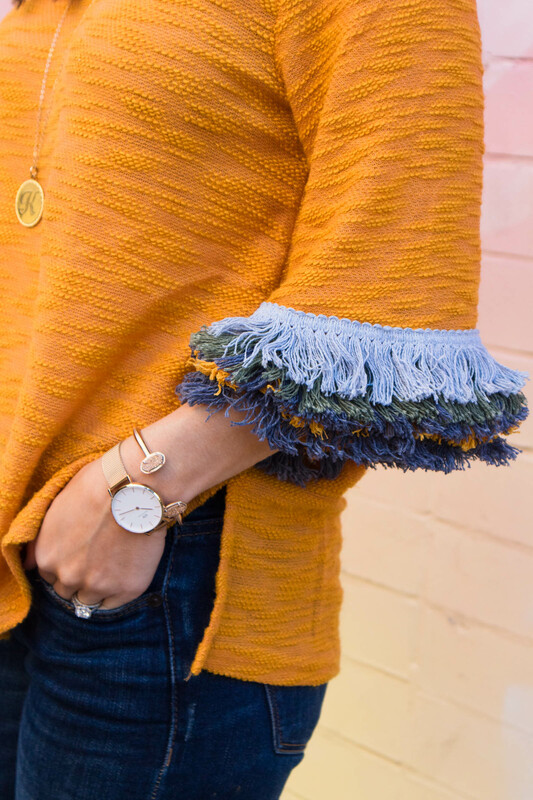 LOVE this sweater – the fringe sleeves are perfect!